AMES, Iowa — How is the creative process captured or cultivated with a computer program? How is coding transforming the created product? 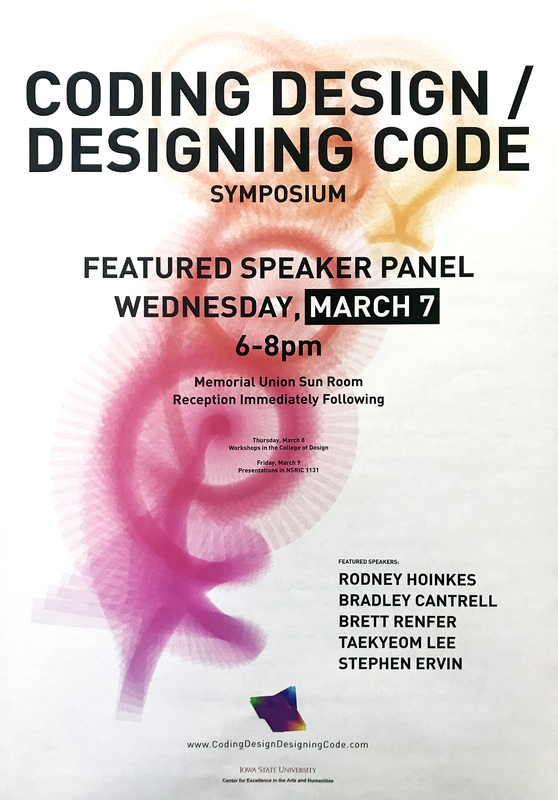 Researchers, scientists, designers and artists from a spectrum of disciplines will come together March 7-9 at Iowa State University to address these questions during “Coding Design / Designing Code,” the 2018 Center for Excellence in the Arts and Humanities (CEAH) Symposium. Organized by College of Design assistant professors Caroline Westort, landscape architecture, and Alex Braidwood, graphic design, the free symposium will highlight innovative creative programs, products and experiences produced through computer programming and approaches to coding that enhance the creative process. The three-day event will include a keynote panel discussion with the symposium’s five featured speakers, presentations, performances, exhibitions and interactive workshops. See the complete schedule. Bradley Cantrell, professor and chair of the University of Virginia Department of Landscape Architecture, whose work focuses on the role of computation and media in environmental and ecological design. Stephen Ervin, director of computer resources, assistant dean for information technology and lecturer in landscape architecture at the Harvard University Graduate School of Design. His research and teaching focus on design, computing, media and technology with special interest in landscape modeling and visualization and the integration of CAD and GIS. Rodney Hoinkes, “chief disruption officer” for the Food and Drink Innovation Network in London and a serial entrepreneur, landscape architect and algorithmist who has authored some of the most innovative and powerful landscape modeling and visualization software. Taekyeom Lee, an assistant professor of graphic design at Appalachian State University and an interdisciplinary designer who specializes in digital fabrication, creating his own 3D printers and advancing the technology’s capabilities in ceramic printing. Brett Renfer, the creative director of Bluecadet, a company working at the intersection of art and technology, who is also an adjunct faculty member in the New School’s design and technology program and New York University’s interactive telecommunications program. His work ranges from large-scale, interactive installations to digital media. Each speaker will give a brief presentation addressing the two core questions posed by the symposium, Braidwood said, and he and Westort will facilitate an interactive conversation among the speakers and the audience. They look forward to pulling people from a variety of disciplines together into “an active, deliberate space where we can learn from each other,” he said. All symposium events are free and open to those who register online. The symposium is funded by a CEAH symposium grant with additional support from the College of Design, Department of Graphic Design, Department of Landscape Architecture and Department of Art and Visual Culture.